Travel along the San Francisco Bay faster, farther and closer to the sights then any tour boat on the bay, and in a more private and personal setting. Departing from world famous Pier 39, you'll be outfitted with foul weather gear to keep you warm and dry from the occasional splash. 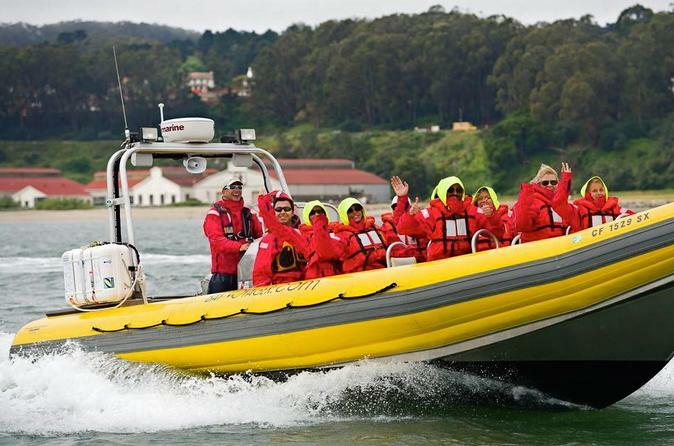 You'll board the only 12-passenger Rigid Inflatable Boat on the bay. You'll see it all up close and learn more about the bay then ever imagined. Take some of the best photos of your vacation on this tour. This small-group tour is limited to 12 people, ensuring a more personalized adventure. Explore The Ferry Building, Presidio, past Alcatraz, and cruise under the Golden Gate and Bay Bridge on this 90-minute tour. You will have the opportunity to explore the city front, and back to our home port for a quick visit to the world famous Pier 39 Sea Lions where you can see them eye to eye. No need for binoculars on this trip, you will see it all up close! Narrated by your captain, you’ll learn something new about this historic area, and view the waterfront in a way that’s unlike any other experience on the bay. Take photos, make memories and enjoy one of the finest ways to see it all up close and explore the bay! This small-group tour is limited to 12 people, ensuring a more personalized experience.